Young adult novels often feature stories of teens trying to figure out who they are, a theme that’s especially relatable for minority youth. So when author Suzanne Kamata offered me a chance to review her new novel, Gadget Girl: The Art of Being Invisible, I was intrigued by the heroine Aiko Cassidy, who is both Hapa and has cerebral palsy. Aiko is a 15-year-old Michigan girl, with a Caucasian mother and a Japanese father she has never known. Like many YA protagonists, Aiko is rather an outcast at school, with the exception of her best friend. In the community, she is best known as the muse for her free-spirited mother, Laina, who wins an art contest and trip to France for her collection of sculptures featuring a female figures that bear an uncomfortable resemblance to Aiko. But what most people don’t know about Aiko is that secretly, she has a creative outlet of her own: she writes and illustrates a Manga ‘zine called Gadget Girl. While Aiko dreams of travelling to Japan to meet her father, she instead must go to Paris with her mom. While most teenage girls would squeal at the opportunity to visit France, Kamata does a good job at making us feel Aiko’s heavy sighing at the idea of making this trip in the shadow of her larger-than-life mother. The mother. She is a more extreme version of me. I’ve tried to promote an awareness of disability through writing about my daughter. My publisher didn’t always approve of the mother’s behavior, which made me feel a little defensive. She’s not evil! She’s doing the best she can! It was hard, if not impossible, to find representations of biracial kids in Japanese picture books and toys. I think it might be a little easier in the United States nowadays. There are quite a few well-known hapa models and actresses in Japan, which is good, I guess, but they tend to be exoticized. I remember being at a playground once with an Australian friend and our kids, and a Japanese woman wanted to take pictures of our kids because they were so exotic. And interestingly enough, none of Kamata’s works have been translated into Japanese, although she says they have been well-received by other foreigners in Japan. 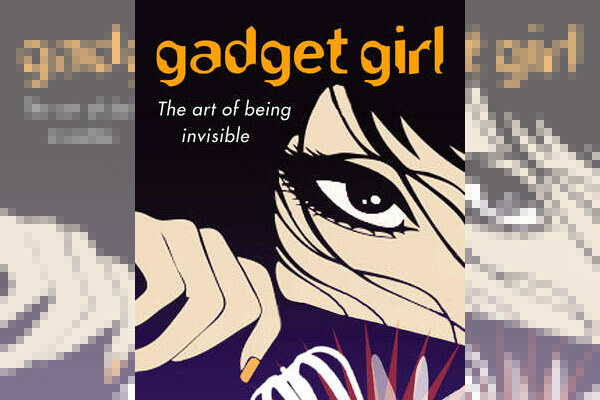 Don’t forget, you can order Gadget Girl: The Art of Being Invisible through IndieBound and have it delivered to your local bookseller. Plus a part of the sale benefits HapaMama.